Click the button below to search our Apollo on-line catalog of books and other resources available to Tuttle Library members. The following electronic resources are free to library members. To use, click on one of the icons below, click on "sign in", select the Tuttle Library, then enter your library card number. The PIN is your telephone number. 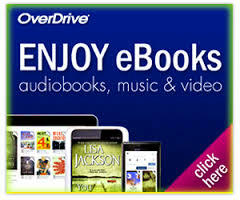 Downloadable audio books, ebooks, and streaming videos. Now access Lynda.com with your Tuttle Library card for free. Follow the link to the Lynda.com portal then enter your library card number and your phone number is your PIN. View or print pdf excerpts from our Tuttle Library Policies below. You must have Adobe Reader installed on your computer, available here. Each file opens in a separate web page, which you may close or leave open after review. Our complete (424 KB) Tuttle Library Policy Manual is available here. Internet and Computer Policy Form here. Meeting Room Reservation Form here. The following are free, public domain databases made available here by the Tuttle Library.